The mutual benefit societies began to flourish in Italy since the revolutionary movements of 1848 to compensate for the non- existence in the legislature of any social law to somehow regulate the world of work. 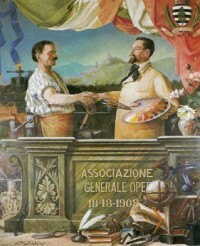 Supported by the Savoy Legislature, which recognized the mutual aid societies to acquire legal powers, associations multiplied, especially in northern Italy between 1860 and 1870 . Even emigrants abroad soon felt the need to create similar associations, with the aim to provide assistance to members in case of sickness, unemployment, poverty and, in case of death, to cover funeral expenses and guarantee the financial and emotional support to the family . In Rouse, this movement took shape in the Mutual Aid Society Dante Alighieri , founded October 26, 1902 by a mix of Italians and Tyroleans and moved to Walsenburg in 1913 and still active ( albeit with different purposes ) to Denver in promoting cultural Italian identity in the modern American society . A special thanks to John Bellotti for documents and information.